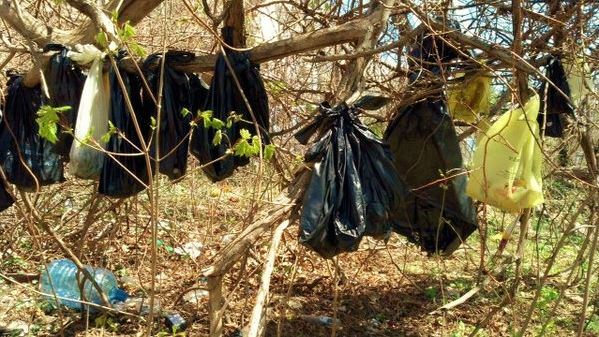 Bodies of cats and kittens found hanging from tree in bags. It’s horrific to think people can be so heartless and cruel. The New York Times reports 25 cats and kittens have been found hanging in plastic bags from a tree in Yonkers, New York. There’s a feral cat problem in the area and someone, or a group, decided this was a way to treat the issue. The cats’ bodies reflect blunt force trauma to their heads. It’s reported based on stages of decay and number of skeletal remains found that this could have been going on for at least a year. The ASPCA is offering a reward of $5000 toward any information that leads to arrest and conviction for those involved in this case. The SPCA of Westchester, the lead agency on the case, is offering a reward of $13,250. Please, if you have any details, alert the SPCA of Westchester: 914-941-2894.